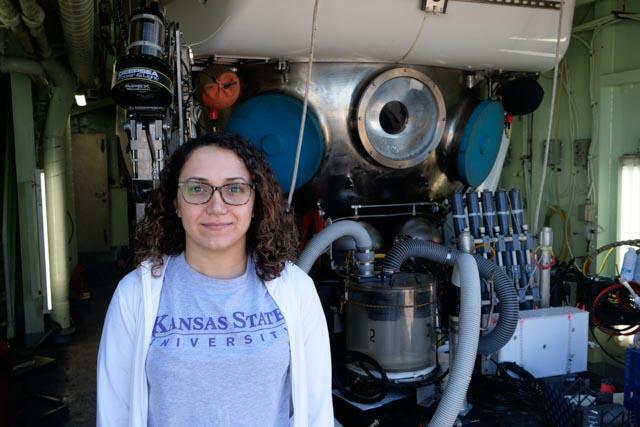 Aida Farough, a Kansas State University teaching assistant professor of geology, has been spending weeks at sea on research vessels while she studies the ocean floor, underwater volcanoes and hydrothermal vents. In this video, Farough discusses her work on the U.S. research drilling vessel called the JOIDES Resolution. Video courtesy of the JOIDES Resolution. Download the following photos and photo cutlines. 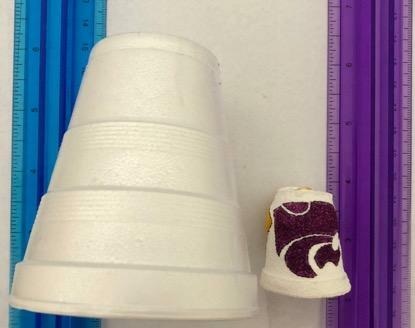 MANHATTAN — Kansas may be landlocked, but that has not stopped a Kansas State University geologist from going 1.5 miles underwater to explore the deepest parts of the Pacific Ocean. 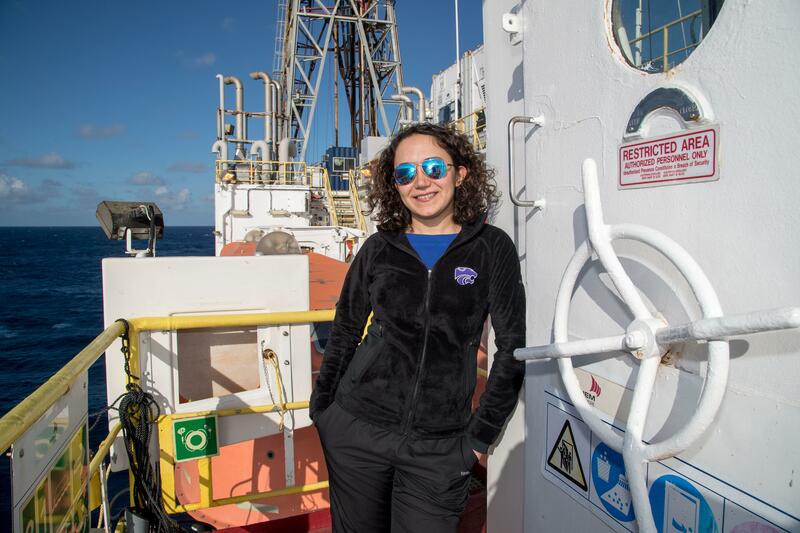 Aida Farough, a teaching assistant professor of geology, has been spending weeks at sea while she studies the ocean floor, underwater volcanoes and hydrothermal vents at mid-ocean ridges. But Farough's underwater explorations are doing more than helping scientists understand the minerals and microbial life on the ocean floor. Her research can provide key insights to the origin of life on Earth as well as the existence of life and hydrothermal vents on other planets. "Just because we don’t have an ocean in our backyard in Kansas, we shouldn’t ignore the oceans and the opportunities of marine exploration," Farough said. "We know less about the oceans than we know about some of the planets in our solar system. In fact, we have better maps of Mars than parts of the oceans within the U.S. territory." That's why Farough is involved in several large international research projects that are aiming to learn more about the geologic processes on the ocean floor. Her research deals with three things — water, rocks and heat — and the interactions among them. She is primarily interested in fluid flow and heat transfer in seafloor hydrothermal systems, which are like chimneys or vents on the oceanic crust. "Much of the work that I and many other scientists do is hampered by lack of data, such as heat flow from the seafloor," Farough said. "To collect such data, one has to make a trip to an actual study area. My study area just happens to be 1.5 miles underwater and spread out over square miles of rugged seafloor." Farough just returned from three weeks on the research vessel Atlantis in the Pacific Ocean off the coast of California. During the ocean cruise, Farough dove to the bottom of the ocean — a depth of 2,500 meters, or about 1.5 miles — in Human Occupied Vehicle Alvin. Alvin was involved in the 1986 exploration of the wreckage of the Titanic. Atlantis researchers focused on the mid-ocean ridge called East Pacific Rise. Mid-ocean ridges are regions of the oceanic crust where heat, fluid and lava escape from deep below the seafloor through the spreading of tectonic plates. 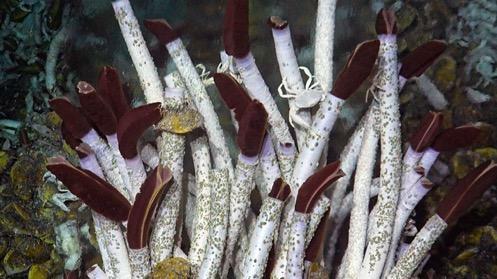 Hydrothermal vent systems are found along mid-ocean ridges and host rich ecosystems. The research vessel, or ship, is a floating science lab full of analytical instruments. 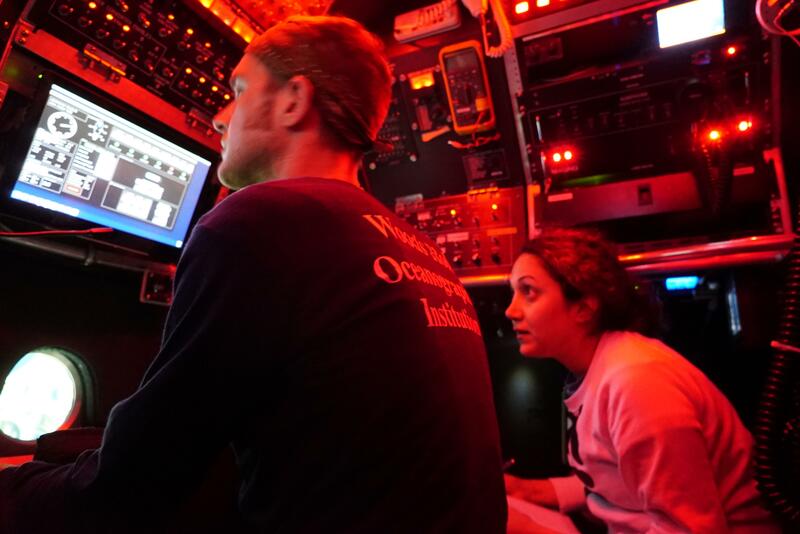 During oceanic cruises, researchers like Farough gather rock samples and data from the seafloor, either by drilling or by driving submersibles to the bottom of the ocean. When Farough was on the bottom of the ocean, she used instruments to measure heat from hydrothermal systems, where material from inside the Earth is released into the ocean in the form of hot, black water. The temperatures of hydrothermal fluid reach up to 680 degrees Fahrenheit and the heat supports nearby ocean life, such as crabs and tubeworms. 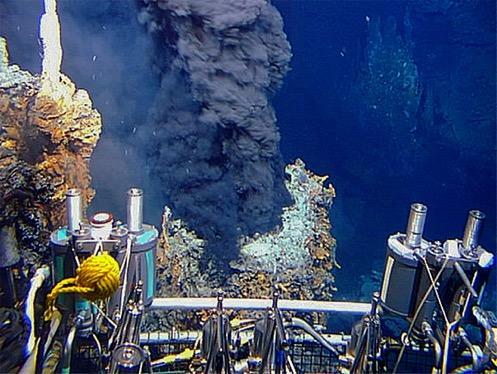 Hydrothermal vents may have been present on early Earth and could provide key insights into the early evolution of the Earth and life, Farough said. Her research also links to hydrothermal vents on planetary bodies, such as Saturn's moon Enceladus, which has a global liquid ocean. "The heat from hydrothermal systems is responsible for life thriving in the most hostile environments on Earth, deep in the oceans where there is no sunlight and seawater temperatures are near freezing," Farough said. "Learning more about hydrothermal systems can take us a step closer to understanding heat distribution in oceanic crust, origination of life on Earth and existence of life on other planets." Farough's underwater dive was part of a National Science Foundation-funded research cruise with the University-National Oceanographic Laboratory System. 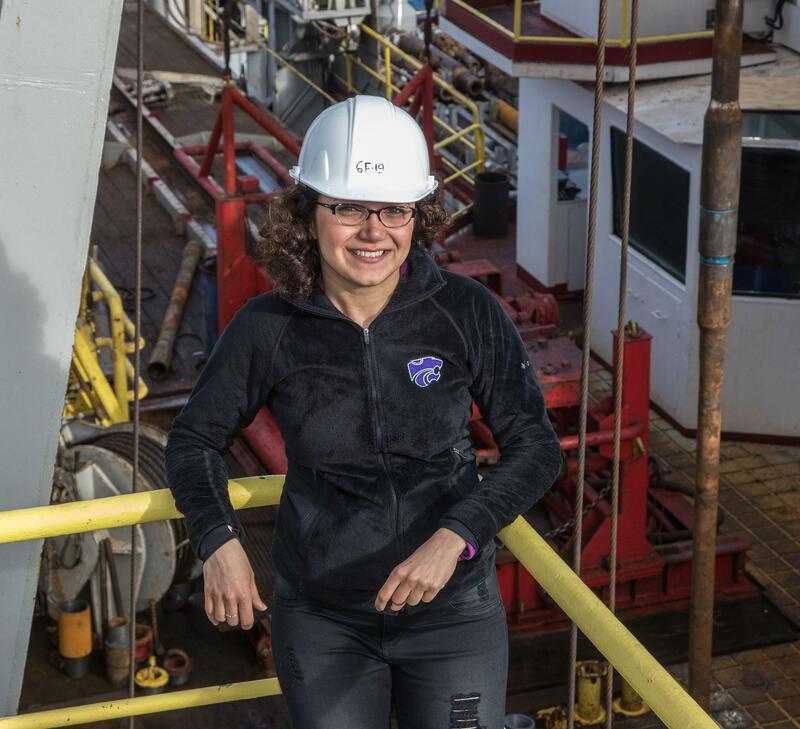 Farough was one of 11 early career U.S. scientists selected for the cruise to investigate underwater volcanic, hydrothermal and biological activity. Farough also recently spent two months with International Ocean Discovery Program scientists on the U.S. research drilling vessel called the JOIDES Resolution to study the mineral resources near Brothers volcano, which is the most hydrothermally active volcano in the Kermadec Arc in the Pacific Ocean northeast of New Zealand. 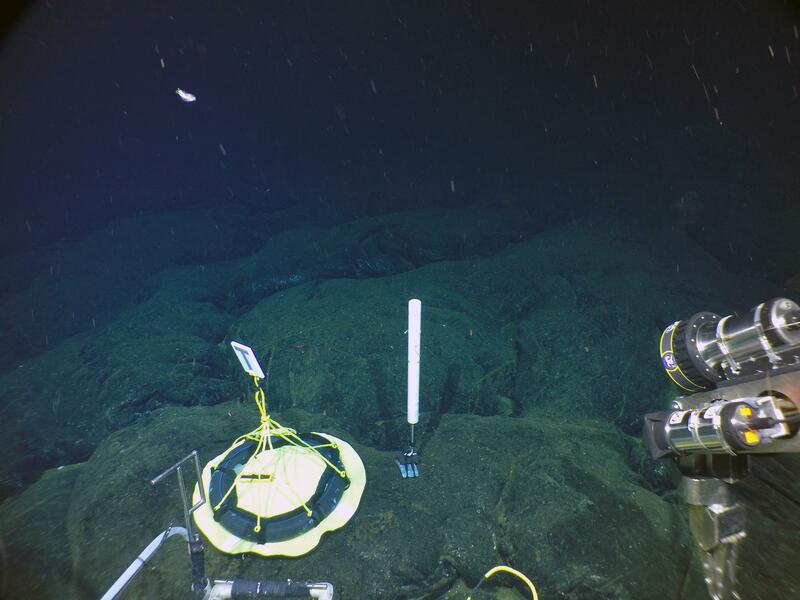 The project marked the first attempt to drill into a submarine volcano. Farough was selected as one of 11 researchers from the U.S. on the 34-person science team that also included researchers from Europe, Japan, China and the United Kingdom. Farough is specifically studying the fluid transport properties and permeability of rock samples from Brothers volcano. She also spent two weeks on Japan’s drilling vessel, called Chikyu, to analyze cores drilled from the ancient seafloor in the deserts of Oman. The Oman Drilling Project focuses on oceanic formations at mid-ocean ridges, hydrothermal alteration of the seafloor and mass transfer between the crust and the oceans. The Oman Drilling Project involves 166 scientists representing 30 countries from five continents. Now that she is back on land and in Kansas, Farough is further analyzing the rock samples and data she collected at sea. This includes evaluating the samples' physical properties, such as permeability, density and porosity. She is collaborating with many other scientists and engineers to achieve her scientific goals. "Mineral resources play an important role in the Kansas economy, but population growth is constantly challenging us to seek more resources," Farough said. "Now that mining and farming on the moon and colonization of Mars are becoming a reality, why not consider using the resources in the oceans first? Oceans have so much to offer to us, including unknown and unlimited amounts of energy and mineral resources." Download multiple photos and photo cutlines.